Today I would like to present you another HYIP, which has its roots in the finance world. At least The Rise Of Finance legend claims it. It’s a program with short-term plans varying from 1 day to 40 days. The Rise Of Finance has joined Standard Listing on DavidNews.com 8 days ago. Now I have reinvested $200 and will keep you updated on the payment status of this program. This program looks like a typical short-term program. It has 8 different investment plans available for both beginners and pro players due to the low minimum deposit requirement - $20. You don’t see often HYIP’s accepting such low minimum deposits for all investment plans. There are 8 different terms available starting from 1 day and up to 40 days. Initial deposit is included in the payments for all plans. That’s the reason why we can see high-interest rates. However, I recommend doing your own calculations or using the calculator on the home page to understand the interest rates. Keep reading if you think such type of investment plans seems reasonable to you. 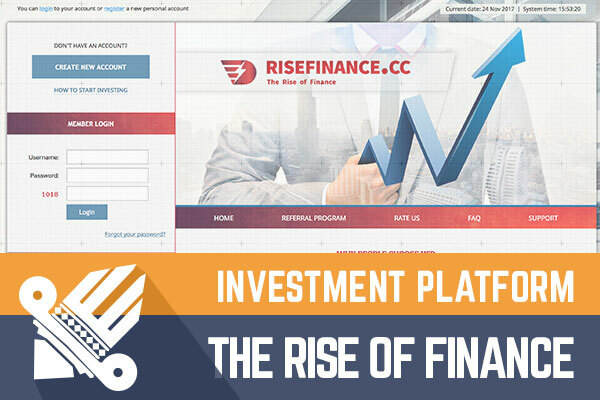 If we look at the starting date indicated on the website of The Rise Of Finance the question is how this HYIP has survived with such plans since the 16th of September (launch date on the website)? I mean for the long-term program it would be totally fine but for a HYIP like this - it’s already a lot. In my opinion, it should have been in a sleeper mode for a while and most likely it has become more active in November. Unfortunately, we can’t predict the activity, which would help to understand if it’s worth joining such program. Sure, it depends on the number of deposits and withdrawals, which we have no clue about. Therefore, always be skeptical about statistics on the website. The administration of The Rise Of Finance has chosen low profile marketing approach. We don’t see any company registration details, social media profiles or giveaways. It’s a standard program with a very generic legend about experienced financial and technical specialists. Probably, avoiding marketing expenses is the secret how the admin can manage to keep the fast paying HYIP on the track at least for some while. The downside of it is that it’s harder to attract new investors to the program. The Rise Of Finance is accepting payments from 4 most common payment options – PerfectMoney, Bitcoin, AdvCash and Payeer. The program allows users to have an unlimited number of deposits with different deposit terms, which is a way to diversify the potential income. Unfortunately, the problem is that all deposits are kept in one program and probably it’s safer to diversify investments in several programs instead of one. Minimum withdrawal is $0.5, and all withdrawals are processed manually within 24 hours’ time. Even though there are 8 different plans available, I suggest paying attention only to the first 4 plans with investment term up to 10 days. As I wrote earlier, we don’t know the status of this program and it’s hard to predict how much money is in it now and when it will stop paying. The four plans have the following interest rates and terms: up to 130% after 1 day, up to 220% after 3 days, up to 450% after 6 days and up to 800% after 10 days. Please do your own calculations to understand what is what. For example, after 1 day $200 deposit would make a net profit of 2%, after 3 days - 8% and so on. Of course, the longer deposit term – the greater net revenue and risk. For example, $200 invested in the plan after 6 days (the golden middle between 1 and 10) would make a 3.33% daily net profit and at the end of the term, such deposit would make a net profit of $40. We are looking now at the program worth the name HYIP due to its high rates. However, we don’t have a clue when the program became more active and what’s the status of it (deposits, active users, withdrawals). Therefore, all I can do is to share my thoughts about the program. It’s impossible to predict when the admin will make the next move and what it’s going to be. Therefore, if you ever decide to make any investments, don’t invest more than you can afford to lose! Have you already made an investment in The Rise Of Finance and have noticed anything worth sharing with us? Please drop a message in the chat box to share your experience! Investment plans: 102% up to 130% after 1 day, 108% up to 220% after 3 days, 120% up to 450% after 6 days, 140% up to 800% after 10 days. Forget about other investment plans. 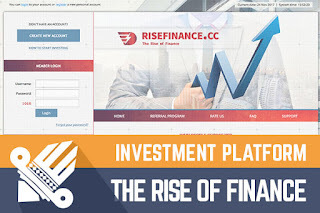 Join The Rise Of Finance Here!